Here. Us. Now. is a documentary film commissioned by the Ewing Marion Kauffman Foundation, the largest American foundation to focus on entrepreneurship. 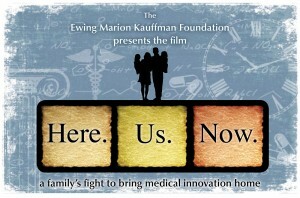 The film chronicles one family’s fight to bring medical innovation home. Register for the screening on September 28th in Hollywood, CA. Chris and Hugh Hempel are in the fight of their lives. Their identical twin daughters, Addison and Cassidy, have been diagnosed with Niemann-Pick Type C, a rare, incurable and fatal genetic disease that causes progressive neurological deterioration. As the devastating effects of the disease begin to take hold, the Hempels enter a world of complex medical literature, complicated clinical trials, and cumbersome regulatory mazes where new drug discovery, invention, and approval are slow and ineffective. The Hempel’s story reveals the grim truth that rare disease is all too commonplace. Despite unprecedented investment in medical research and development, there are thousands of known rare diseases and disorders without treatments and cures. It’s a broken system moving at a tedious pace, and it leaves heart-rending personal stories in its wake. To spur medical innovation, the United States funds (privately and publicly) more than $95 billion per year in medical research. A 2007 Milken institute report estimated that if little were changed, chronic diseases would amount to $4.2 trillion in lost economic output and costs of treatments. if modest progress could be made, then the economic impact could be reduced by up to $1.1 trillion annually. Clearly, there is a significant link between the impact of medical research and treatments. Rare and genetic diseases affect one in ten (or 30 million) Americans and 350 million people globally. More than 7,000 distinct rare diseases exist, and approximately 80 percent are caused by faulty genes. the National institutes of Health estimates that 50 percent of people affected by rare diseases are children, making rare diseases one of the most deadly and debilitating for children worldwide.